If you’re looking to avoid the fumes and noise of the traditional lawn mower this Spring, you may want to make a visit to your local Home Depot. This week, the retailer announced that it will carry the new EGO line of electric yard tools including a foldable, cordless lawn mower so quiet it won’t wake the neighbors. What makes the EGO line special is its use of a newly developed, incredibly powerful 56-volt lithium-ion battery. After a quick 30-minute charge, the EGO Cordless Lawn Mower will be ready to use with no cords and no noise. The mower is so quiet, in fact, that it comes equipped with headlights so you can mow in the dark. Many electric yard tools can struggle with a big job, but according to Popular Mechanics, the 61-pound EGO push mower exceeded expectations, "providing 45 minutes of consistent cutting power and repeatedly filling its bag with grass clippings and shredded leaves." Popular Mechanics also praised the ease of use of the mower's spring-assisted single-lever height adjustment. 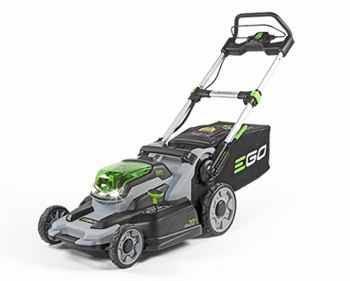 The EGO 56V Lithium-ion Cordless Lawn Mower is available for purchase exclusively in Home Depot stores and at homedepot.com for $499. A cordless blower, string trimmer and hedge trimmer, all powered by the same type of 56-volt battery, are also available. For more on the EGO line, visit the company’s website or watch out the promotional video below. If you’d rather stick with a traditional gas mower this year, I recommend you check out the new Toro Recycler with SmartStow – it’s the first gas mower that can be stored vertically. The Powerful, Quiet EGO Electric Lawn Mower really good. Here i get many important think about lawn Mower. we face the high noise of the lawn mower but here is free that good.The EGO and powerful battery help a lot. Last is the price is not bad at all consider every think. Really i like it. A great product and make sure it has many outstanding advantages compared to other mowers available on the market. This is a new one to me. I have seen lots of cordless vacuums with LED headlights but never a lawn mower. I guess we learn something everyday, thanks for sharing this. I like the idea of cutting grass at night. I like to cut grass at dusk. My company is pretty much stuck to doing our work in the daylight hours. This mower might work for someone with a small enough lawn to be cut in 45 minutes after work. I recently read a review on the best lawn mower and must say that the Ego POWER + is a very good electric lawn mower. Its power, quiet, and best of all saved me ton of money on gas. I like the quality of this mower. Thanks for this very interesting article. It would be great to have a robot lawn mover but I agree that we should wait. It would be really hard to find someone to repair it, almost like mission impossible. It can also be problem for children and pets especially dogs. I think that cats are less risky. I will wait this such robot lawn movers will cost less and be more advanced. 45 minutes of cutting doesn’t sound a lot but I’m sure it’s adequate for most small to mid-sized lawns.